Description: Southbound manifest climbs out of the small town of Caliente and begins the hard pull toward Tehachapi. Description: Crossing the river again, Westbound manifest train with BNSF power leaves Miamisburg. Description: A trio of mid-train DPUs' help carry a manifest freight around the Columbia River. This shot was taken across the river from the Oregon side. Description: A Westbound BNSF stack train is lead by a pair of Dash 9s, one in the Heritage II (It was pair up with a UP SD70M ealier) and a Warbonnet. Description: BNSF 5350 West lead by a pair of Dash 9s is about to pass SD40 - 2 #1716, the new Yard Switcher, while it is switching cars. A pair of Soo Line SD60s can be seen in the distance on a train in the yard. Description: BNSF 4732, 4854, & 5350 wait with a train of covered hoppers on the balloon track at ADM in Mendota, IL. 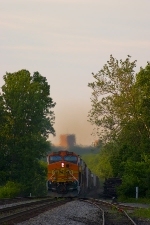 Description: BNSF 5350 waits on the balloon track at ADM in Mendota,IL. Description: After meeting a northbound coal empty, this warbonnet led freight heads south from CP Merriam on the BNSF Ft. Scott Sub. Description: At CP Charlie on the BNSF Ft. Scott Sub., the dispatcher has instructed this pair of trains to swap crews before continuing south, and they are in the process of that activity now. Description: After swapping out crews, a 700 series warbonnet leads a southbound mixed freight away from CP Charlie in Lenexa on the BNSF Ft. Scott Sub. Description: BNSF Westbound Z, BNSF-5350-1090-794-4717, Decending Marias Pass. Description: BNSF Westbound Z Decending Marias Pass., BNSF-5350-1090-794-4717. Description: H2, H1 and two Warbonnets!